Author of Taboo, Manoj Jain will host his first book reading session on 7th Jan 2017. He will render excerpts from his book The Total Holistic Centre, which revolves around a holistic centre and the three characters who seek a cure to impotency, insomnia and arthritis. An Inspiring book reading session that will help one break from the shackles of the society and come to express their deepest secret. The book reading will be followed by an interactive session with the author. 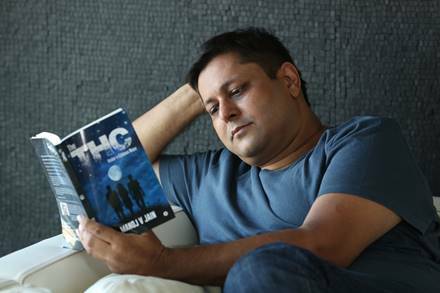 The THC, under a gibbous moon, is a gentle adult novel that deals with some everyday situations and other not-so-common problems. The three characters of the book visit a health farm, The Total Holistic Centre (THE THC) to heal their physical ailments... there is Samar who hopes for a cure for impotence and an addiction to nicotine, Sanjaneka who suffers from arthritic osteoporosis and Varun who is depressed and an insomniac. The trio become friends at the THC and help each other heal and in their short stay, the need to learn that physical ailments are very often a by-product of deeper psychological trauma and that to cure themselves they must close the doors from the past and open new ones ahead. The author explores the mindset of people and everyday happenings in life.